Didier Deschamps has atrributed France’s 2018 FIFA World Cup triumph in Russia to their mental quality. 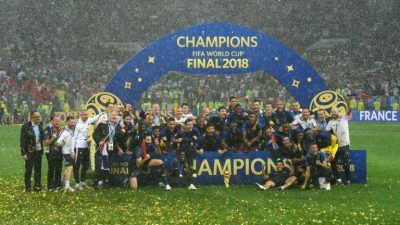 Les Bleus who won their first title in 1998 on home soil join the likes of Brazil, Germany, Italy, Argentina and Uruguay as crowed World Champions on more than one occassion. 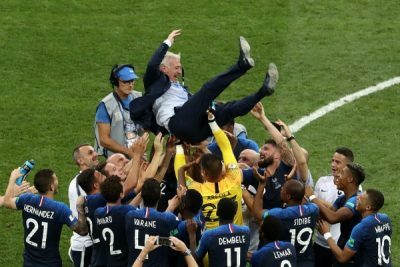 Deschamps became the third man in history to win the World Cup as a player and a head coach after Brazil’s Mario Zagallo and West Germany’s Franz Beckenbauer. An own goal from Mario Mandzukic, a penalty strike from Antoine Griezmann before second half strikes from Paul Pogba and Kylian Mbappe seven minutes later sealed victory for France despite goals from Ivan Perisic and Mandzukic. “How marvellous! It’s a young team, who are on the top of the world. Some are champions at the age of 19,” Deschamps said his his post match interview. France played super eagles in 2014 world cup. They defeated Nigeria at round of 16 .the same Team that failed to win the World Cup has just won the cup because of continuity and proper planning . if nigeria is to qualify for the next World Cup we must start preparation now. Is it with Chris Giwa? Or you forgot that, FIFA’s attention is now on Nigeria. Except at most 3 years ban.